Here is the original art from today's listing on Wafflewares. 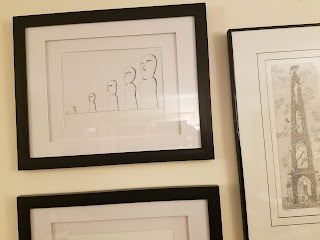 The Moai statues hang in a cluster of black and white art that features an Edward Gorey piece and a cityscape from a local comic book artist. This piece - which immediately became a favorite of ours when Peanut created it - started out as a lame school project. 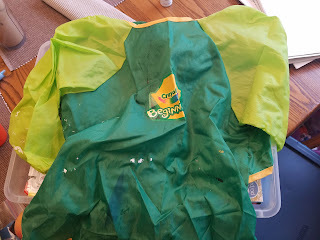 We are a homeschooling family. The advantage to homeschooling for us is that we can tailor everything we do to Peanut's interest and learning style. Her two main interests are art and science. As I plan various school projects and activities, I do my best to incorporate these two interests as much as I can. Geography is super easy - the world has no lack of interesting things to look at and draw/paint/sculpt, plus each culture has their own art forms to explore and experiment with. They have whole books devoted to this which makes my job so much easier when I plan. Geography Through Art is a favorite resource of ours, but even this book as a few duds. 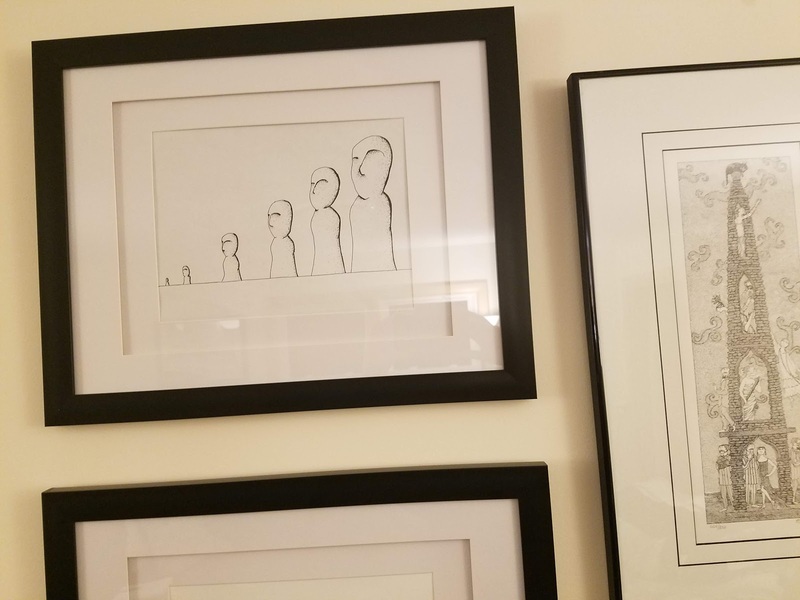 When we last studied South America, I chose a project about Easter Island and the Moai from the book that was a study in one point perspective. Remember doing these in middle school art class? Draw a horizon line on your paper and then a draw a diagonal line from where the horizon meets the edge of your paper to the opposite corner of the page. The page features a fuzzy black and white photo of the Moai lined up. I remember opening the book to this page and being met with a "really?!" look from Peanut. Of course, horizon lines and one point perspective were considered far to basic for my budding artist. Even so, she took the book and a couple sheets of drawing paper and said she'd do it - probably out of fear that I would make her memorize South American countries and capitals if she didn't. A few days later, she produced the piece that now hangs on the wall. She decided to make it into a study on shading and stippling. The fact that she also managed to get some work on one point perspective was just icing on the cake. She said that she found a few reference photos on the web that served as better inspiration than the picture in the book. (So we can throw some internet research skills on the list of what this project accomplished). I learned a long time ago with Peanut to give her an idea and a few resources and then let her do her thing. My thoughts on how the project should go almost never come close to what she ends up doing.